To deal with a student's poor intonation appropriately, a teacher must know the specific cause of the problem. Many causes exist, most of which can be fairly easily detected (if not always so easily eliminated). These include lack of practice, lack of coordination, an untrained ear, and such "mechanical" problems as faulty strings or a poorly cut reed. There are, however, a number of other factors that are more complex and are probably not considered by most teachers. This article deals with a variety of such factors, each of which has been subjected to considerable scientific study. The information presented should provide possible explanations for poor intonation that seems to have no other obvious cause. 1. There exists an inverted-U relationship between level of arousal (or motivation or drive) and performance in a discrimination task (see Figure 1).3 In other words, discrimination performance improves as arousal increases, but when arousal increases beyond a certain point, performance begins to deteriorate. 2. 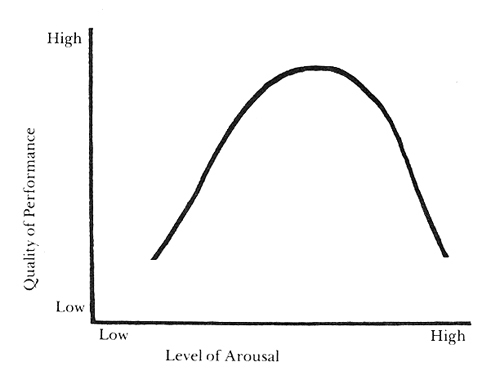 The optimal level of arousal is inversely related to task difficulty. Thus, a simple task is best learned under high arousal and a complex task is best learned under low arousal. Although research proving that the Yerkes-Dodson Law applies specifically to intonation remains to be done, it seems safe to suggest that if a person plays out of tune only when performing, and is not aware of it, it is best to spend time trying to reduce his or her performance anxiety. In the long run this may yield better results than trying to deal directly with the student's faulty intonation. This research suggests that facial tension, which has been shown to have a significant effect on various aspects of performance,9 may also interfere with intonation. As teachers, we tend to advise our students who play out of tune to focus all their attention on their playing. Although this usually results in an improvement in intonation, it may actually have the opposite effect. In some cases intonation improves only when the student lets his or her mind wander. This is supported by several studies showing that although reducing attention to a stimulus helps some subjects detect small changes in that stimulus,10 the optimal level of attention in a pitch-discrimination task varies from person to person.11 It is therefore important for teachers to determine the optimal level of attention for each of their students and to adjust their teaching accordingly. This optimal level seems to depend in part on the level of the student and on the difficulty of the music being played. In particular, I have found that advanced students trying to achieve perfect intonation in a fairly slow and simple passage can frequently play better in tune if they look away from their instruments and let their minds wander. Auditory fatigue has been shown to have a significant effect on what is known as the "difference limen" (the smallest change in pitch a person is able to discern). A study published in 1970 found that after listening to sounds at 60 dB (that of normal conversation) and pitches near middle C, the average difference limen (DL) increased by about thirty percent.14 (Another study found a forty percent increase in the DL with 10-20 dB sounds even though no TTS occurred.15) With a larger DL a student is less able to discriminate pitch and, presumably, less able to play in tune. Although there is some question concerning the applicability of these results to musicians who are "highly experienced in making pitch judgments,"16 it is probably best to encourage students with intonation problems to play very softly when practicing passages that tend to be out of tune. It is not unheard of for a student who normally has good intonation to play extremely out of tune when performing in public without even realizing it. As discussed above, this may be explained by using the Yerkes-Dodson Law. Another explanation may lie in the fact that the effects of auditory fatigue are increased by certain "central" (psychological) factors. (Research published two years later, in 1965, replicated this study with a 40 dB sound and found differences in TTS to be even greater. Another study, however, did not find any increase in TTS.18) Performing musicians are involved in a form of mental activity far more engrossing than arithmetic: the sheer terror of playing in public. This, it seems, should cause even greater auditory fatigue and, consequently, a greater deterioration in pitch discrimination. A central factor that has received much less study concerns the listener's attitude toward the sound. Researchers in Germany studied the effect of sound on three experimental groups: group A was told that the sound indicated errors in a task they were performing; group B was told that the sound indicated success in the task; group C heard the sound without engaging in the task. Using a 95 dB sound, they found the average TTS of group A to be about forty percent higher than that of group B and sixty-five percent higher than that of group C.19 (A later study, also done in Germany, obtained similar results.20) This research suggests that a musician who is led to believe (correctly or not) that his playing is very poor and filled with errors will suffer from greater auditory fatigue. A similar defense mechanism has been found to exist for auditory perception. In particular, recognition of anxiety-provoking auditory stimuli has been found to be worse than recognition of "neutral" stimuli when the sounds are presented rapidly or softly or are obscured by other sounds.24 It may be that poor intonation is anxiety-provoking for a student who is used to being sharply criticized for playing out of tune. Such a student, when playing softly, rapidly, or in an ensemble, may fail to recognize (and therefore fail to correct) faulty intonation. By not harshly criticizing our students for playing out of tune we may be able to avoid or eliminate this problem. Perceptual defense has been shown to operate in both the visual and the auditory perception of words. Lacking studies dealing with the perception of pitch, this factor must be applied somewhat speculatively to the subject of instrumental intonation. The reader may justifiably question how practical all of this information is. In my own teaching I have devised various "tricks" that help my students play better in tune, such as looking away from their instruments or playing softly. My goal was to seek scientific evidence that would explain why these tricks work. While finding studies supporting the sections on performance anxiety, muscle tension, attention, and auditory fatigue, I also discovered two other factors (psychological factors in auditory fatigue and perceptual defense) that, theoretically at least, can be applied to intonation. Therefore, except for the two factors just mentioned, the methods discussed have been shown to be effective in improving faulty intonation in practice as well as theory. 1Robert M. Yerkes and John D. Dodson, "The Relation of Strength of Stimulus to Rapidity of Habit-Formation," Journal of Comparative Neurology and Psychology 18 (1908):459-82. 2Studies supporting: P.L. Broadhurst, "Emotionality and the Yerkes-Dodson Law," Journal of Experimental Psychology 54 (1957):345-52; Norman J. Bregman and Hunter A. McAllister, "Motivation and Skin Temperature Biofeedback: Yerkes-Dodson Revisited," Psychophysiology 19 (1982):282-85. Study refuting: Risto Näätänen, "The Inverted-U Relationship Between Activation and Performance: A Critical Review," in Attention and Performance IV, ed. Sylvan Kornblum (New York: Academic Press, 1973), 155-74. 3"Level of arousal" generally refers to a person's level of alertness or excitement. Like performance anxiety, it involves changes in respiration, pulse, blood pressure, and skin temperature. 4E.D. Longenecker, "Perceptual Recognition as a Function of Anxiety, Motivation, and the Testing Situation," Journal of Abnormal and Social Psychology 64 (1962):215-21; William E. Broen, Jr., Lowell H. Storms; and David H. Goldberg, "Decreased Discrimination as a Function of Increased Drive," Journal of Abnormal and Social Psychology 67 (1963):266-73. 5Memorization: Frederick A. Courts, "Relations Between Experimentally Induced Muscular Tension and Memorization," Journal of Experimental Psychology 25 (1939):235-56. Discrimination: Elizabeth Duffy, "The Relation Between Muscular Tension and Quality of Performance," American Journal of Psychology 44 (1932):535-46; Milton F. Shore, "Perceptual Efficiency as Related to Induced Muscular Effort and Manifest Anxiety," Journal of Experimental Psychology 55 (1958):179-83. 6Barbara F. Bruno-Golden, "Relaxation Training Used to Enhance Listening Skills and Productive Oral Comprehension for a Language-Delayed Child" (Ph.D. diss., Boston University, 1978). 7R.C. Davis, "Motor Responses to Auditory Stimuli Above and Below Threshold," Journal of Experimental Psychology 40 (1950):107-20. 8Arnold A. Gerall and Charles Snyder, "Non-Specific Muscular Tension and Auditory Threshold," Perceptual and Motor Skills 14 (1962):182. 9Daniel Kazez, "Facial Tension and Grimaces in String Playing," American String Teacher 33 (April 1983):34-37. 10Lee E. Travis, "Changes in Auditory Acuity During the Performance of Certain Mental Tasks," American Journal of Psychology 37 (1926):139-42; Alice J. Hamlin, "Attention and Distraction," American Journal of Psychology 8 (1896):3-66. More recent studies have not been done in this area. 11R.F. Wyatt, "The Improvability of Pitch Discrimination," Psychological Monographs 58, Whole No. 267 (1945):1-58; Franklin O. Smith, "The Effect of Training in Pitch Discrimination," Psychological Monographs 16, Whole No. 69 (1914):67-103. 12Although these terms are usually used interchangeably, some researchers use the former term with loud sounds and the latter term with soft sounds. 13Scott N. Reger and Dean M. Lierle, "Changes in Auditory Acuity Produced by Low and Medium Intensity Level Exposures," Transactions of the American Academy of Ophthalmology and Otolaryngology 58 (1954):433-38; Frank P. Comella, "An Exploratory Study of Musical Stimuli and Inducement of Auditory Fatigue" (Ph.D. diss., University of Iowa, 1972). 14Donald W. Nielsen, Winifred D. Fraser, and Donald N. Elliott, "Frequency Discrimination in the Adapted Ear," Journal of the Acoustical Society of America 47 (1970):540-45. 15John F. Brandt, "Frequency Discrimination Following Exposure to Noise," Journal of the Acoustical Society of America 41 (1967):448-57. 16Paul H. Skinner and Frank Antinoro, "Perstimulatory Tracking in Pitch Perception at Different Sensation Levels," Journal of the Acoustical Society of America 46 (1969):427. 17Joel S. Wernick and Jerry V. Tobias, "Central Factor in Pure-Tone Auditory Fatigue," Journal of the Acoustical Society of America 35 (1963):1971. 18William E. Collins and Mary J. Capps, "Effects of Several Mental Tasks on Auditory Fatigue," Journal of the Acoustical Society of America 37 (1965):793-96; W.D. Riach and J. Sheposh, "Further Observations on the Central Factor in Auditory Fatigue," Journal of the Acoustical Society of America 36 (1964):967-68. 19H. Hörmann, G. Mainka, and H. Gummlich, "Psychische und physische Reaktionen auf Geräusch verschiedener subjektiver Wertigkeit: Zeitweilige Hörschwellenverschiebung und Elektromyogramm" ("Psychological and Physiological Reactions to Noise of Different Subjective Valence [TTS and EMG]"), Psychologische Forschung 33 (1970):289-309. 20H.-G. Bosshardt and H. Hörmann, "Protective Inhibition: A Central Factor in Auditory Fatigue," Psychological Research 40 (1979):207-21. 21Jerome S. Bruner and Leo Postman, "Emotional Selectivity in Perception and Reaction," Journal of Personality 16 (1947):69-77; Leo Postman, Jerome S. Bruner, and Elliott McGinnies, "Personal Values as Selective Factors in Perception," Journal of Abnormal and Social Psychology 43 (1948):142-54. 22Elliott McGinnies, "Emotionality and Perceptual Defense," Psychological Review 56 (1949):244. 23Not supporting: Thomas Plocher, "Perceptual Defense or Response Suppression: Re-Examination," Perceptual and Motor Skills 37 (1973):35-38. Supporting: Rene A. Ruiz and Herbert H. Krauss, "Perceptual Defense versus Response Suppression," Journal of Psychology 69 (1968):33-37; Leonard J. Williams and James R. Evans, "Evidence for Perceptual Defense Using a Lexical Decision Task," Perceptual and Motor Skills 50 (1980):195-98. 24Shabse H. Kurland, "The Lack of Generality in Defense Mechanisms as Indicated in Auditory Perception," Journal of Abnormal and Social Psychology 49 (1954):173-77; Donald E. Broadbent and Margaret Gregory, "Perception of Emotionally Toned Words," Nature 215 (1967):581-84; Anand Kumar, S.N. Srivastava, and C.B. Dwivedi, "Visual and Auditory Perceptual Defense of Early and Late Adolescents," Perceptual and Motor Skills 50 (1980):882. Daniel Kazez is Professor of Music at Wittenberg University (Springfield, Ohio). He earned a bachelors degree at Oberlin Conservatory, masters at Peabody Conservatory, and D.M.A. at the University of Michigan-Ann Arbor. Kazez has performed recitals throughout Europe, including London (Manor House and Sternberg Centre), Paris (Temple Victoire), Brussels (Cercle Ben Gurion), and Rome (Il Pitigliani). He has performed at international festivals in Berlin, Prague, and India and presented a concert tour in Eastern Europe with performances in the Czech Republic (Prague and Český Krumlov), Poland (Łódź, Częstochowa, and Cracow), and Hungary (Budapest). He has performed in Casablanca and in Morocco’s three “imperial cities”: Meknes (Royal University Moulay Ismaïl), Marrakesh (National Conservatory), and Fez (Centre Maïmonides). Kazez has performed and lectured in Bangkok and northern Thailand and has recorded with a Bombay film orchestra (Hum Ko Deewana Kar Gaye, 2006). In India, he gave a series of 14 lectures/performances, in Bombay (Indian Institute of Technology and Indira Gandhi Institute of Development Research), Madras (one-week residency at the School of the Krishnamurti Foundation in Madras), and Pune (Kala Chhaya Festival). Kazez is author of more than a dozen scholarly articles on music theory, pedagogy, and performance, a dozen editions of music, and two books, including Rhythm Reading (W.W. Norton). Kazez has given talks at 25 U.S. music schools, including Manhattan School of Music and University of Texas. Kazez’s study of world music has taken him to India, Java and Bali, Turkey, Greece, and Thailand.